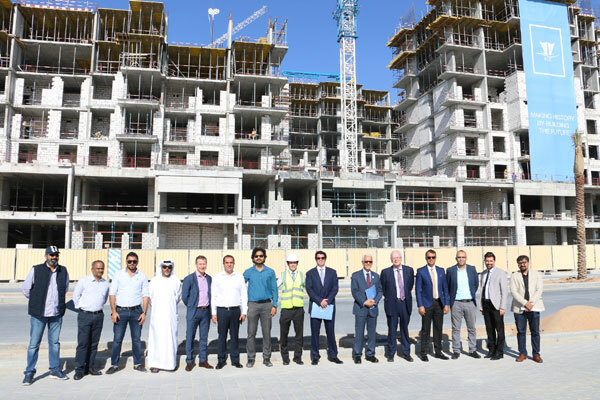 Engineering Contracting Company (ECC) said significant progress had been achieved in the construction of Rawda and UNA, two residential communities of UAE developer Nshama in Town Square Dubai, with more than 40 per cent work completed. Work on Rawda residences project started in February this year and is currently 43 per cent complete, heading towards an early completion in 2020 with a built-up area of 150,000 sq m, said the statement from the UAE engineering group. Rawda Apartments are situated in a prime park-side location, consisting of four residential apartment buildings. The tallest building in Town Square Dubai, Rawda offers direct access to the Town Square Park that spans an area of over 50,000 square metres and features several retail outlets and cafes. ECC holds a diverse portfolio with a track-record of delivering innovative projects and has built a strong presence and solid reputation through its successful ventures and strategic partnerships in the market. Continuing on this path, the company will complete the Rawda project, currently 3.2 per cent ahead of schedule, timely and within budget due to the successful adoption and implementation of Building Information Modelling (BIM) technology – a collaborative engineering technology solution, it stated. BIM helps to plan, design, build, construct and manage building and infrastructure virtually, it added. Furthermore, the involvement of ECC Group’s associated companies – Abanos and PMI, enabled greater collaboration throughout the project. The timely manner in finalizing materials coupled with excellent communication between the contractor, developer and consultant played an integral role in the early completion of the project. Nshama's other project, UNA marks a never-before approach to urban living in Dubai, and is a stylish destination set apart by a digitised all-purpose lobby lounge where residents can indulge in a wide range of creative, recreational and collaborative pursuits. The lobby lounge serves as a social hub featuring work stations, a music room, games corner, communal smart TV, reading space, workstations, and creative zones. Nshama CEO Fred Durie said: "Town Square Dubai has evolved as an established residential community offering customers the opportunity to move to an owned-home lifestyle. Rawda and UNA are new residential launches in Town Square Dubai that have gained positive market response." "We are committed to delivering these residences as per schedule and work with leading contracting companies to achieve our goal. ECC has a strong track-record in project delivery and on-schedule construction to the highest quality standards," he noted. ECC Group's Director Kamal Farah said: "Town Square Dubai is a unique development for the city as it creates a new trendy, integrated neighbourhood with extremely good access to many of Dubai’s important landmarks. I believe that our collaboration with Nshama will yield something special for the market." "The Rawda and UNA projects are prime examples of this as we have managed to surpass our anticipated work schedule by 3.2 per cent, reaching 43 per cent completion in a duration of nine months, an achievement which shows the efficiency of both companies and the quality of process we are using to keep on track," he stated.